An outstanding addition to any outdoor pack, the award-winning OmniLite TI pairs its super-lightweight construction with an advanced, feature-packed design that promises to perform in the most extreme environments out there. Constructed to handle demanding situations and environments, the stove runs on almost any type of fuel – gas, petrol, diesel, kerosene, paraffin and even aviation fuel. It features different jets to optimise its performance and fuel economy but in challenging situations, the stove will work with any jet. A super strong yet lightweight titanium body and legs mean the stove won't add excess grams to your pack and the OmniLite TI is designed to be fully field-strippable so you can service or mend it on the go using the supplied multitool. The OmniLite TI is supplied with a 0.35L fuel bottle as well as a foldable windscreen and storage bag. 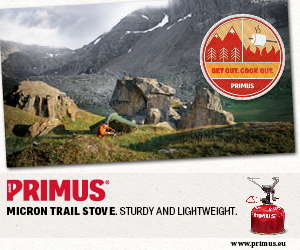 Compatible with the OmniLite TI or any other gas cartridge stove, Primus' innovative Winter Gas is perfect for maintaining your stove's performance when the temperature plummets as low as -22oC. The secret behind Winter Gas's incredible performance lies in the VaporMesh™ technology. A type of paper lining that absorbs the gas in liquid form and increases the surface area from which the gas can transfer from liquid to gas form. The increased surface area results in a quicker transformation from liquid to gas which in turn increases pressure inside the cartridge for enhanced cold-weather performance. Enjoy a warming drink on the move – the rugged TrailBreak EX Vacuum Bottle is an expedition-ready flask made from high-grade stainless steel with a protective silicone sleeve for improved grip and comfort. As well as an insulated cup that has a double-wall stainless steel construction, the TrailBreak EX Vacuum Bottle is supplied with two stoppers. A regular screw in stopper for maximum insulation and a click-close stopper that makes it easy to drink directly from the bottle.